Last week, Flowscape´s partner Fujitsu hosted the Fujitsu Forum in Munich, the biggest IT-vendor event in Europe, gathering over 10 000 IT professionals, business leaders and media representatives. 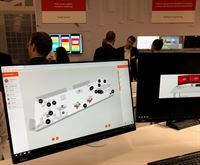 Following "Co-Creation for Success" which was this year's theme, Flowscape was displayed as part of Fujitsu's Digital Workplace package. The Forum participants showed great interest in the Flowscape system's capabilities such as efficient work desks, indoor positioning and office utilization data.
" With Fujitsu's strength as a leading global digital transformation actor and Flowscape's innovative approach to the Workplace Experience, the Fujitsu Forum demonstrated the powerful joint offering we bring to the table together" says Anders Malmström, VP Global Partners & Marketing at Flowscape.